The cast of GLORIA: A Life. Photo © Joan Marcus. With the audience sitting in a fire side circle surrounding a warm and cozy liberation of rugs, cushions, and blocks, courtesy of scenic designer Amy Rubin (Signature’s Thom Pain), with pretty obvious period costumes by Jessica Jahn (Cherry Lane’s One Night), straight-forward lighting by Jeanette Oi-Suk Yew (KPOP), flickering sound design by Robert Kaplowitz (Broadway’s Fela!) and Andrea Allmond, the strong cast of capable and dedicated performers guide us through her historic enlightenment. Gloria flips through the historical imagery and testimonies like we are scanning a Ms Magazine filled to the brim with facts and interviews, reading the headlines and occasionally stopping and studying the feminist facts, reading about both the successes and failures. One great learning moment is the naming of the magazine Ms. a word that means “the exact parallel to Mr‘, a more powerful proclamation than I ever truly knew. With some fantastic period photo and video work projected on the walls by designer Elaine J. McCarthy (Broadway’s Wicked), especially all those magazine covers, the piece feels extremely relevant and particularly educational, particularly the moments of letter readings and testimonials on abortion and letters to the editor. (L-R) Joanna Glushak, Christine Lahti, Fedna Jacquet and Francesca Fernandez McKenzie. Photo © Joan Marcus. Intellectually invigorated throughout, I sometimes found myself emotionally put-off struggling to find depth within its historic backdrop. I wanted Mann, Lahti, and company to slow down, take a few deep breaths, and stop trying to inform and teach but engage within the heart and pain of the matter. There was attempts with the mother/daughter interactions, and although symbolically they had great meaning, the writing failed to give it a real earthbound feel to their complicated dynamic, floating on the surface of staged biography moments rather than the deeper painful conflict that is at the heart of the matter. Joanna Glushak and Christine Lahti. Photo © Joan Marcus. The taped segments, especially the archival videos of historic speeches are moving, but made me ache a bit for at least one actual video of the real Steinem speaking. Lahti does a fabulous job bringing the woman to life (to the point where audience members in part two referred to her as if she was actually Gloria), but when the videographer implanted a cutout rectangle of Lahti responding to the famous interview on Larry King Live, it looked oddly fake (in comparison to all the others) and distracting from the internalized message. In my humble opinion, it was a perfect moment to give us a bit of the real Steinem speaking without detracting from Lahti’s magnanimous performance. The pictures of her though, standing proudly alongside such trailblazers as Flo Kennedy and Bella Abzug, played joyfully by Glushak, strengthened the connection, and made Gloria: A Life a fitting and full tribute piece worthy of our attention and our praise. Especially in this day and age when resisting and action is required more than ever. That became even more detailed and dynamic during part II, the talking circle when the audience is asked to join in with the conversation. It’s hard to describe, as the stories told the night I went all resonated with more guts and power, registering sometimes more strongly than the actual play and its staging. 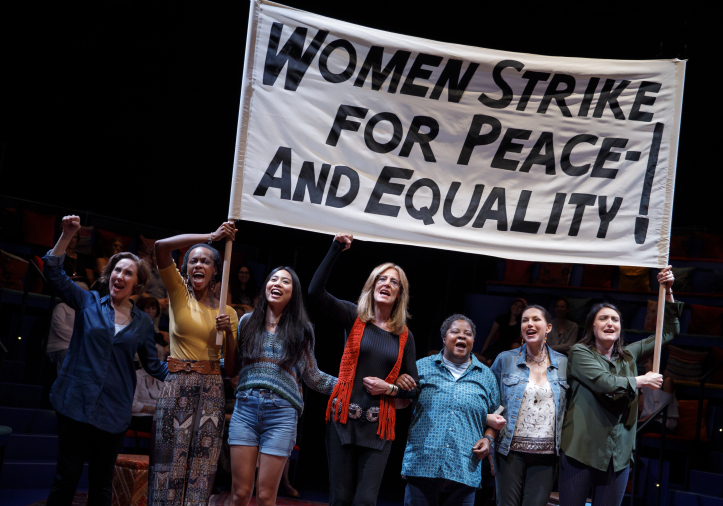 Christine Lahti as Gloria Steinem in GLORIA: A Life by Emily Mann, directed by Diane Paulus, at the Daryl Roth Theatre. Photo © Joan Marcus. CORETTA: “Let this message go forth from Houston and spread all over this land. There is a new force, a new understanding, a new sisterhood against all injustice that has been born here. We will not be divided again. It reminded me of an interview with the compelling Lea DeLaria, an American comedian and actress renown for her outspoken political-ness, especially around the idea of the LGBTQ community. She rightly questions the inclusiveness of what all those letters stand for and wonders if they do stand for unity. Do they represent a solidarity of these communities or a categorical separation that hinders itself in its supposed support? I wonder about that, post-show, on the subway home, thinking about the Women’s March on Washington where so many amazing women and others turned out in the thousands world-wide protesting the horrible-ness of the #OrangeMonster and all that he stands for. I heard many men say, “it’s a Women’s March“, so they didn’t go, but the LGBTQ community turned out strong, linking their arms with the movement against the GOP powers that be. But months later, when the LGBTQ March on Washington occurred, many women stayed home, saying that it wasn’t their march, or something along the lines of, “I already marched“. And I get that, sort of. Protest-fatigue was settling in. But I turned out for both and as many more that I could, trying my hardest to be there protesting for every marginalized group, not just the one that I felt I belonged to. It’s a strange brew, to find your cause, but also join with a greater cause that doesn’t exactly fit neatly in your persona, but understand the unity of the message, and how it relates to all. Be a proud male feminist, like that wonderful Prime Minister of Canada, Justin Trudeau who calls himself just that, or a gay male who stands with the Trans community and the Lesbian community for equal representation under the law. Or a privileged white woman who can rise up and resist the authorities over unfair immigration and border incarcerations. We need to sit around that talking circle and listen closely, and that find glorious and powerful shared power. I want to be a hope-aholic as well. Will you join me? Christine Lahti and Fedna Jacquet in GLORIA: A Life by Emily Mann, directed by Diane Paulus, at the Daryl Roth Theatre. Photo © Joan Marcus.